Here's what I've found out so far....Rodriguez made a couple of recordings in the late '60's and early 70's under the SUSSEX LABEL that went just NOWHERE. ' Sorry...nice try'...Pretty much the end of his story..IN THIS COUNTRY, that is. He left music and went back to work a as manual laborer in Detroit..... BUT, Not known to him, his recording took off in South Africa, supporting the anti-Aparteid movement. He was compared to BOB DYLAN in that country...but, was rumored dead...killed in a violent death in a live concert in the U.S.A. In 1998, his daughter ran across a web site dedicated to her father...and, at this point Sixto became very aware of his popularity abroad. This award-winning documentary charts the extraordinary and inspirational story of mysterious 1970s musician Rodriguez. In the late '60s, a musician was discovered in a Detroit bar by two celebrated producers who were struck by his soulful melodies and prophetic lyrics. They recorded an album that they believed was going to secure his reputation as one of the greatest recording artists of his generation. In fact, the album bombed and the singer disappeared into obscurity amid rumors of a gruesome on-stage suicide. But a bootleg recording found its way into apartheid South Africa and, over the next two decades, it became a phenomenon. Two South African fans then set out to find out what really happened to their hero. Their investigation led them to a story more extraordinary than any of the existing myths about the artist known as Rodriguez. This is a film about hope, inspiration and the resonating power of music. 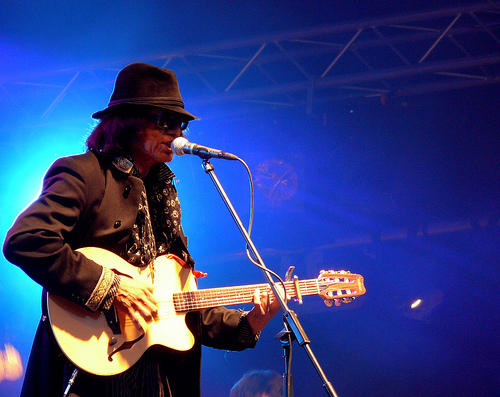 SIXTO RODRIGUEZ video links below.